In Hokkaido, all onions are mechanized transplanted and mechanized harvested. The harvested onions are placed in the storage bins during the harvest. In Hokkaido Japan, the onion seeds are germinated in greenhouses beside the fields and once the small onion plants have 3 or 4 leaves they are transplanted with small transplanters behind small tractors. These small tractors and transplanters make it possible that the beds are very close together, using 2 to 3% more land per hectare than in Europe. This is also the reason that all onion fields have one track through field to allow bigger equipment getting to the other side of the field. A typical onions field in Hokkaido, with its greenhouse at the background and one wide track from one side to the other. These pictures where made in the middle of the growing season, there for the transplanters were stored. But these 4 pictures below give an impression of their extreme small size, even the tractor used to pull this equipment. The small seedlings are fed into the transplanter in biodegradable trays. 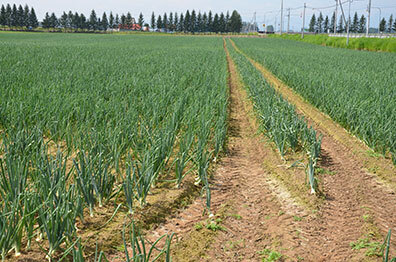 All onion fields in Hokkaido have one track that allows normal sized equipment getting to the other side of the field. Beds are extremely close together, made possible by using mini tractors with very narrow wheels during transplant, fumigations and harvest. 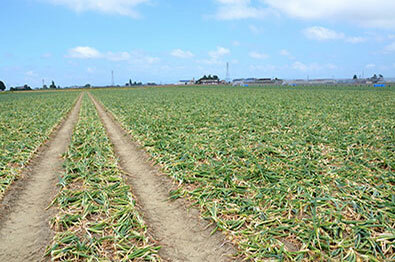 In Hokkaido, the climate and land are such, that rice and onions are produced side by side. Rice and onions are produced side by side. 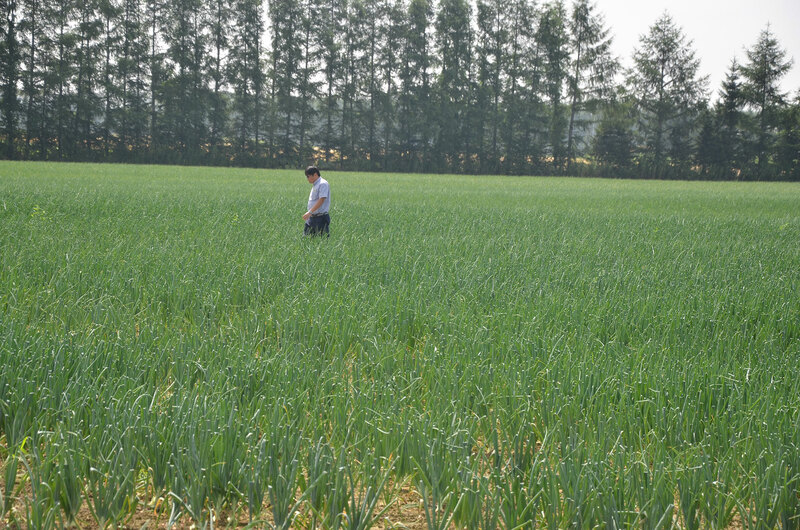 Checking not yet matured onions. Mature onions ready to be harvested.